It is hard to find a person that is neutral when it comes to mushrooms. You either like them or you don’t. From my perspective, the more people that dislike mushrooms the better, in other words, that’s all the more mushrooms for me! For party platters, raw mushrooms are just fine and add a lot to the plate. But to add even more, try stuffing your mushrooms with some favorite flavors. The soft, delicate taste of the mushroom is enhanced by the flavors of many other foods including caramelized onions, shrimp, crab and lobster. Brush mushrooms. Pull stems from mushrooms. Finely chop the stems and two of the mushroom caps. Set aside. Melt butter in a medium frying pan over moderate heat. Add finely chopped onion, celery, carrot and Bell pepper. Fry, stirring often, until onions start to caramelize. Season with SAlt and pepper and Italian seasoning. Add parsley and reserved chopped mushroom and continue to cook until mushroom is soft and vegetables are tender. Remove mushroom mixture from pan and set aside. Add a splash of red wine to the pan and stir to deglaze. Cook until reduced to a thick pan sauce. Add p-an sauce to mushroom mixture and stir to mix. Divide the mushroom mixture, about 1 tablespoon of the mix into each mushroom cap. Press gently to seat the filling but not too hard so as to not break the mushroom cap or compress the filling.. Arrange on a baking sheet. 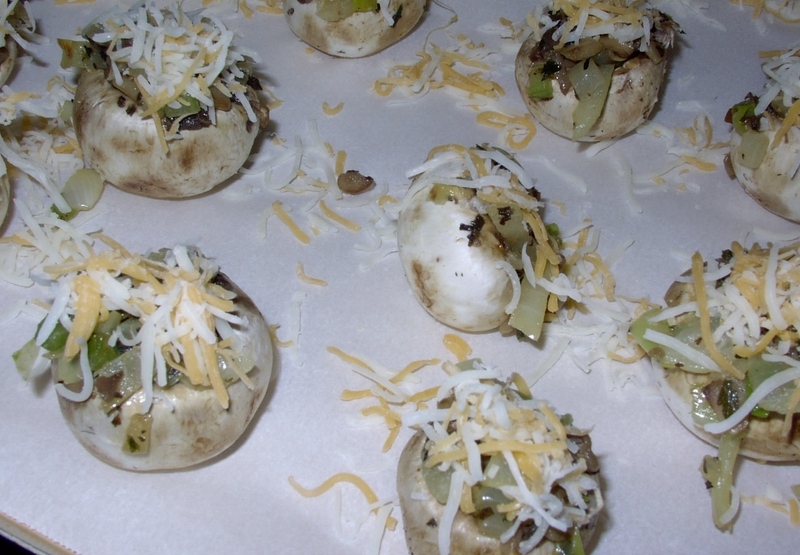 Sprinkle each stuffed cap with grated cheese - Parmesan, Romano, Cheddar, Monterey Jack or a combination, your choice. Cook under broiler for 3 to 5 minutes or until cheese is hot and bubbly.